This blank answer sheet is what you’ll use when you take any licensing exam certified by the American Radio Relay League (ARRL) Volunteer Examiner Coordinator (VEC). Exams from other VECs are similar. Download and practice taking an exam with this sheet so that you’ll be familiar with it on test day. Here are two typical questions from the Technician exam. 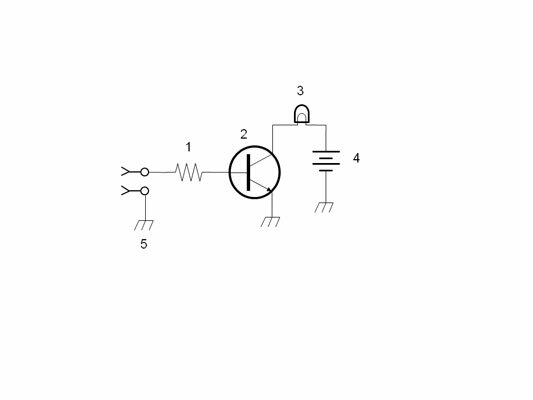 The second question refers to a simple schematic shown in the figure. 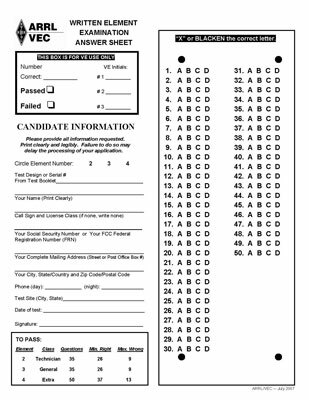 The complete question pools for all three license exams are available from the National Council of Volunteer Examiner Coordinators (NCVEC). T2B10 — What is the Q signal used to indicate that you are receiving interference from other stations? The answer is A. You would draw a solid black circle over A on the answer sheet for that question. T6C02 — What is component 1 in figure T1? 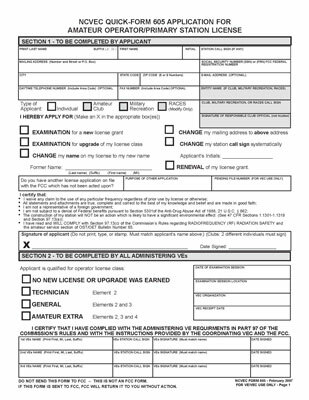 After you pass your exam, you’ll happily fill out a form like this one, to be signed by the Volunteer Examiners (VEs).